I saw this incredible image by Francesca Resta (above), and I hope I’m not infringing on any copyrights by setting it to a trance I did last night. It’s just too good. If it helps, I’m making no profits off this whatsoever. The following is an energizing trance set to my friend’s djembe. Oh, and it’s a beautiful djembe. I got to visit it yesterday. My research tells me that the word djembe comes from a Bambara portmanteau of the verb “to gather” and the noun “peace”. The phrase is, “Aslithar Alle, Valhalla Visir, Magn i rotum vinda skal, Magn i rotum vefa skal.” You might translate it as, “To all Gods and Wise of Valhalla, May your roots be strongly wound, may your roots be strongly woven.” I got the phrase from a Wardruna album. So, beautiful artwork, beautiful drum and beautiful phrase. If there are any contraindications to doing this trance, I would just say if you have heart problems, anxiety or chronic pain/sensitivity, consult with a physician before accessing this media in a trance state. At least when I did it, it gave me a stronger buzz than a cup of coffee. It’s probably best to do it in the morning, or do it before a physical activity like working out or hiking. Visual: The ideal view will be a projector or possibly those newfangled screen goggles they use for VR. Otherwise, a clear screen that you can gaze at directly will do. Audio: I recommend bluetooth headphones, either earbud or overear. Sound is only 2-Channel, so surround is unnecessary. Scent: use your usual trance essential oil. If you aren’t fixed to a particular one, try something invigorating such as grapefruit or cinnamon. Taste: Pairs well with a rich black tea like assam or keemun. If available, a chai or Seattle Market Spice Tea would suit. For evening, a spiced mead would also pair nicely. Tactile: Use your typical garment and pendant. If you don’t have a preference, I suggest a light garment, such as a dhoti or chemise, as this exercise may raise your body temperature. Pendant options may include, aside from an image of the Goddess herself, a shield, arrow, cat, heart or the rune Fehu. Begin by performing your ward in the way you are accustomed. Balance and center your position, cross-legged on the floor, sitting in a chair, or standing with the support of a staff. Set the video to fullscreen and press play. Try toning with the chant. You may need to listen a few times to get the chant because the arrangement changes throughout. Try swaying, bowing or moving with the chant within your warded circle. Try an entire session of looking into the eyes of the Freyja image. Consider the levels of reality as you do this: to what extent is the subject of the image real, and to what extent are you simply on another realm of existence? When finished, remember to ground yourself with a sensory activity, such as reversing your ward, changing into civilian clothes, and watching some form of unrelated media. For this one, I can simply say that a being is with me, and she is talking about how the energizing trance video can be used, giving me the warm richness of blurred trance into sleep, slipping the smooth opiate of writhing sleep to my wired disposition. Upon waking I felt refreshed despite the few hours I slept, wondering what the next day would bring. Yeah, she was with me. I’m going to be honest, I don’t really know who she is. What I will say is that everything felt comfortable this morning. Every patch of skin making contact with my blanket was filled with ecstatic joy. Just brushing my shoulder up against the fabric of my sheet shot lightning bolts of comfort through me. I’m gonna say this one was a win. Sound keeps on coming up in Paxson, so I wanted to journal specifically about that. The first thing Sequoia told me before I came to join her at her yoga retreat was this: For one month, reduce your consumption of caffeine, alcohol or other substances, reduce your intake of meat, and eat natural, unprocessed foods. Chant AUM at some point every day. Observe the effects that the sound has on you. That was the most transformative part of the journey: the road leading up to it! For one month, I had nowhere to stay, which is fine, because I do well when I humble myself to my friends. I exchanged pranayama breathing lessons with a friend for a place to practice. I cooked for another person in exchange for a place to eat and sleep. Otherwise, I was in the world, without the safety of a place to live. My home was in AUM. Let me be clear, my lifestyle was not something I had asked to have, it was just an issue of being between teaching contracts. I learned a lot during that time, and I was able to reflect on sound in a way that would be meaningful to me both during and after the yoga retreat. However, I obtained few of these by conventional means. The first instrument, I acquired after spending two years with a satsang group who practiced something like kirtan (except never officially acknowledged as such). The second two were gifts from my adopted family in Korea. The Masai drum was a random find in a Women in Need store in downtown Victoria. The bowl was inherited from my mom, who was once a practicing Buddhist. The guitars I picked up second-hand in my new home in Canada and played extensively at Satsang. The final instrument came when my daughter wanted to learn how to play Didg. She lost interest over time, but I still love to play mine. trance stories: the new meditations pt. 2 & new book! 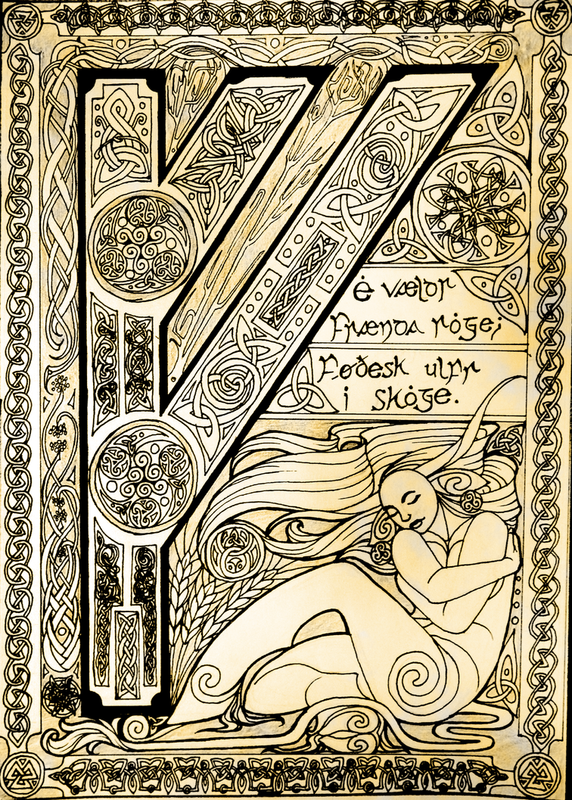 First, the new book we’ll be studying: from Diana Paxson comes “Taking up the Runes”! Our group is studying this co-currently with “Trance-portation”. I’m so ready. I particular, the advice of the introduction is to study from the heart moreso than the head. That will be a bit of challenge for me, but I feel like today’s excerpt in trancing will culture me to do just that: Emotional memory. I wonder if my recent online gender-switching activity might offer some insight into this. Want to see what I’m talking about? This, apparently, is what I would look like as a female. In a single day, social media lit up with people trying to find out what they would look like as a different gender. The reason I find this so fascinating is that it affirms that there are inherent differences to how a face is structured, but moreover, I’m noticing that the way a person gazes tells a lot about them. If I were to see a woman looking like this, I would assume she’s confident, relaxed, unafraid, and ready to face anything. I myself, do not feel like this is my personal character. I have all kinds of insecurities, worries, hang-ups, and the like. So for exercise 14, I’m having a lot of difficulties understanding how to recall my feelings of the time. I’ll do my best. So now I will be able to relive a past event, and feel what I was feeling before. The event I chose was being on a mountaintop with my friend from California, Andrew. It was an odd experience, but we were both very excited to go camping in February. It may have been a tad ill-advised, and indeed we didn’t expect it to be so cold. Side-by-side I had feelings of elation and feelings of fear. We were far out in the countryside, not close to any urban area. It was in the middle of the world’s largest estuary seawall. We could have died. But up there on the mountain, we had the chance to truly feel alive. Is this interfering with life or work? No, actually. Although I am seriously starting to question if I have enough challenge at work. But that can be good thing. Are your sleeping and eating habits changed? Not particularly, but I am more aware of my vegetable intake. I’m also quite aware of the effects that medication has on me. I’m going to say the checksum is fine for now. 19: Choose a non-traumatic life event and return to it. Write down all the particulars. NOW, this very much summarizes everything we’ve been doing so far, in previous chapters, up to and including this chapter. So, let’s activate it. Here’s the thing about notes: they are only useful so far as you apply the logic. What does it look like in practice? I use this poetic excerpt for the questions it raises about life, for its depth of interpretation and ambiguity of meaning to the author never officially addressed. And it’s a super-cool trip. For spheres of energy, I have a routine consistent with tai chi, but I look forward to adapting to Paxson’s form. 19. ~has been amazing. Returning to that mountaintop. I have some video of it as well. It’s… beyond words. 20. Okay, checksum time: How is this affecting me? Well, it IS making my writing richer in imagination, which is a benefit. Detriments? I should be hitting the pavement and researching literary agents. I keep getting rejected. These meditations help face the reality of the rejections, though. They remind me that the world is broad, I’ve seen much in my life, and this is not the end. Finally, what is happening in the dream world? Many social interactions. I’m still there, still taking note. But a very strong voice told me to contact another friend from California. Why now? Every now and then, after I have gone off and lived life a bit, been through some major changes, and embarked upon a new venture, I will get this really strong voice that tells me to contact her. An actual physical voice, yelling at me in the early morning hours. I have no idea why. 11. Get a thing! Render it within your imagination! Think of it: in your waking life, things are but images. They have concrete detail in your mind, and your mind alone. They are no more restrictive than concrete items in your dreams. You train your dreams the way you train your waking mind: with a language of images. The lovely piece of this is that you can render an item in your imagination the same way you investigate an item in reality, and vice-versa. This heart-shaped pendant I hold in my fingers was taken from the imagination of its artist. Why could I not do the reverse, and memorize every bump and detail of the charm, and re-construct it in my imagination? That is what Exercise 11 does: allows me to “scan” an image from waking reality into dream reality through observing, remembering and visualizing. How lovely would it be to have tea in my mind? 13. Find a willing volunteer. Use your hands’ touch to find places on the partner’s body that is very warm or cool. Move your hands further away so that the feeling of your presence is still detectable. It is possible also to do this with your own body if a partner is unavailable. Wherever things are tense or aching, bring your hands to those places and feel the alleviation of that pain as you draw your hands away. Mimic this transfer of tension by tensing your body with your hands on it, and releasing the tension as you draw your hands away. Cold will feel stiff, but gradually soften as your hands move away. Hot will feel jittery or saturated, but gradually lose its unease as you lift your hands. This is more than enough for today. I will have much to share tomorrow.